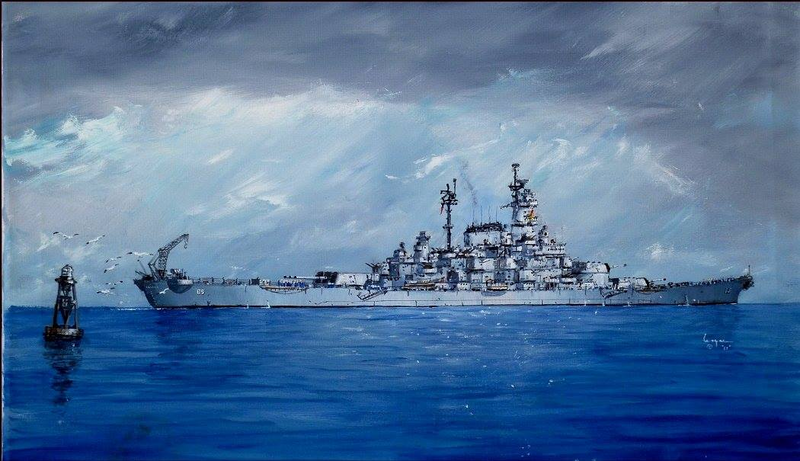 This is a drawing for a friend of mine who is very knowledgeable and very likes the USN warships. Later in 1948 plans were drawn up to convert the Kentucky into an Anti-Aircraft Battleship with large amounts of 5"/54 and 3"/70 AA guns with the replacement of the 16" gun turrets with 2, 3 or 4 quadruple 8" RF gun turrets the same guns used on the Des Moines class heavy cruisers, essentially turning the ship into a battleship sized and armoured but cruiser armed vessel: Not heavy cruiser, not battleship and nether battlecruiser! Because of this I choose to name cruiser-Battleship the early designation of the Battlecruiser and similar armed designs of battleship size but armoured cruiser weaponry. The design became lighter than the original Iowa class battleships but that much lighter because part of the saved tonnage used for thickening the deck armour and the large number of gun turrets and their barbettes too were added quite the extra weight. By the documents system at least 8 projects (Schemes A through H) were proposed but drawings and data are only available about the last 3 with two, three and four quad turrets and a varying amount of 5"/54 and 3"/70 AA guns. I've chosen the 3 turreted Scheme G.